You're probably sick of us writing about the connection between healthy living and transit use. And it's common sense that walking more is good for you. But we can't help sharing this new report that the simple act of wearing a pedometer and keeping track of your steps leads to signficant weight loss, lower blood pressure, and better fitness. A recent article on WashingtonPost.com touted several studies showing a connection between pedometer use and health benefits. I can attest to the power of pedometer. I've been using one a lot this winter and I always record more steps on days that I use transit. Just the walk to the bus stop and the office adds a nearly a thousand steps. Plus recording more steps motivates me to take the stairs every morning. Do you need a free pedometer? 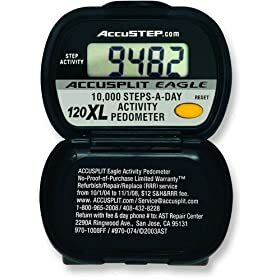 If you work in Portland, go to our on-line order form to choose free transportation resources and get a free pedometer. We'll mail it to you within five business days.